Just the other day, I was at this local event where we did some live reviews for small business owners. It’s always a lot of fun to experience live reactions to some of the statements we make. People start frowning, most of the times. In this post, I will share the things that caught my attention during the live website reviews. The things that were so obvious that made the live website review ‘customer’ facepalm the most. It’s amazing to see how little small business owners have thought about the main purpose of their website. “My website is to inform potential customers of all the things I can do for them.” I call BS on that. We have Wikipedia for that. As a small business owner, the sole purpose of 99% of the websites is to get people to contact you or directly order your products. It has to do with some kind of online interaction that leads to a delivery of goods or services. Add a picture of yourself to the homepage. There were nice, friendly photos on other pages, but not on the homepage. This increases the feeling of being welcome, and trust. Add your phone number in the header of your website. This makes it easy to contact you. People will be delighted that they don’t have to search for your contact details in the footer or on a contact page. Make it easy to contact you. Add a contact form. Contact forms allow for easy contact via email without the need for an email application. Although most of us carry our email with us on our phones, I still very much like filling out a form instead of being redirected to my email app. Show your email address in a visible place as well though, for users who prefer that. One of the sites we did a live website review for, had a menu item stating ‘When’. So my statement was, that this was clearly for opening hours. It was the third of eight menu items, so I knew it wouldn’t be that simple. The person across the table sighed and said: “I get what you mean.” The page was about ‘when to contact me and what I can do for you’. “When” just wasn’t the right menu item name for that. It should be something like ‘products’, ‘treatments’ or ‘services’, and preferably even more specific. One of the websites we did a live website review for, was a site for a health coach. It was clearly about food and exercise, but a huge header image with raspberries (actually a slider,) blocked all information on my 13″ MacBook. Just showing these things helps a lot. Back in the old days, when I built websites myself, I always took a step back from my desk and stared at the design I just set up. Just for a minute. It should be obvious and immediately clear what the website is about and preferably what you can do for your customer. A large header could prevent the user from seeing all the good information that is right below it. If you insist on using a header image, be sure to set the height to a number of pixels that will allow the visitor to see the information. How long are your reading lines? Another thing to consider when it comes to readability is the length of your text lines. You can find a couple of studies about this online, but there doesn’t seem to be a default solution for this. It all depends on the font type used, and the size of your font. In Readability: the Optimal Line Length, Christian Holt mentions multiple suggested text line lengths, stating these should be 50 to 65 or 75 characters. We prefer to talk about a certain number of words per line. Ilene Strizver even takes text alignment into account in her article Line Length & Column Width. She states that non-justified text should be 9 to 12 words per line, and justified text should be 12 to 15 words. From our experience, 10 to 15 words is indeed a good read. Is that exact science? No, definitely not. It’s our experience from reading and reviewing over 1,000 websites. keep your reading lines short for better on-screen reading. These are my pet peeves. What are the things you find most annoying when visiting a website? Looking forward to your comments! 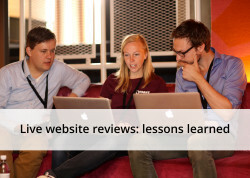 This post first appeared as Live website reviews: lessons learned on Yoast. Whoopity Doo!